There are several tax credits available to you if you make select energy efficiency purchases. Visit Lennox for more details. For full details on tax credits available for home heating and cooling systems, visit www.energystar.gov. Special pricing on our planned maintenance agreements. Call for details. 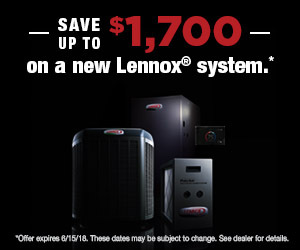 Visit our Lennox Dealer page for rebates on a qualifying Lennox home comfort systems.